The study was carried out to evaluate the effect of prophylactic single-dose intravenous amiodarone in patients undergoing valve replacement surgery. Maintenance of sinus rhythm is better than maintenance of fixed ventricular rate in atrial fibrillation (AF) especially in the presence of irritable left or right atrium because of enlargement. Fifty-six patients with valvular heart disease with or without AF were randomly divided into two groups. Group I or the amiodarone group (n=28) received amiodarone (3 mg/kg in 100 ml normal saline) and group II or the control group received same volume of normal saline. The standardized protocol for cardiopulmonary bypass was maintained for all the patients. AF occurred in 7.14% patients in group I, and in group II, 28.57% (P=0.035); ventricular tachycardia/fibrillation was observed in 21.43% patients in group I and 46.43% patients in group II (P=0.089) after release of aortic clamp. Most of the patients in group I (92.86%) maintained sinus rhythm without cardioversion or defibrillation after release of aortic cross clamp (P=0.002). Defibrillation or cardio version was needed in 7.14% patients in group I and 28.57% patients in group II (P=0.078). A single prophylactic intraoperative dose of intravenous amiodarone decreased post bypass arrhythmia in this study in comparison to the control group. Single dose of intraoperative amiodarone may be used to decrease postoperative arrhythmia in open heart surgery. The efficacy of positive end-expiratory pressure (PEEP) in treating intraoperative hypoxemia during one-lung ventilation (OLV) remains in question given conflicting results of prior studies. This study aims to (1) evaluate the efficacy of PEEP during OLV, (2) assess the utility of preoperative predictors of response to PEEP, and (3) explore optimal intraoperative settings that would maximize the effects of PEEP on oxygenation. Forty-one thoracic surgery patients from a single tertiary care university center were prospectively enrolled in this observational study. After induction of general anesthesia, a double-lumen endotracheal tube was fiberoptically positioned and OLV initiated. Intraoperatively, PEEP = 5 and 10 cmH 2 O were sequentially applied to the ventilated lung during OLV. Arterial oxygenation, cardiovascular performance parameters, and proposed perioperative variables that could predict or enhance response to PEEP were analysed. T-test and c2 tests were utilized for continuous and categorical variables, respectively. Multivariate analyses were carried out using a classification tree model of binary recursive partitioning. PEEP improved arterial oxygenation by ≥20% in 29% of patients (n = 12) and failed to do so in 71% (n = 29); however, no cardiovascular impact was noted. Among the proposed clinical predictors, only intraoperative tidal volume per kilogram differed significantly between responders to PEEP and non-responders (mean 6.6 vs. 5.7 ml/kg, P = 0.013); no preoperative variable predicted response to PEEP. A multivariate analysis did not yield a clinically significant model for predicting PEEP responsiveness. PEEP improved oxygenation in a subset of patients; larger, although still protective tidal volumes favored a positive response to PEEP. No preoperative variables, however, could be identified as reliable predictors for PEEP responders. Renal dysfunction is known to occur during cardiac surgery. 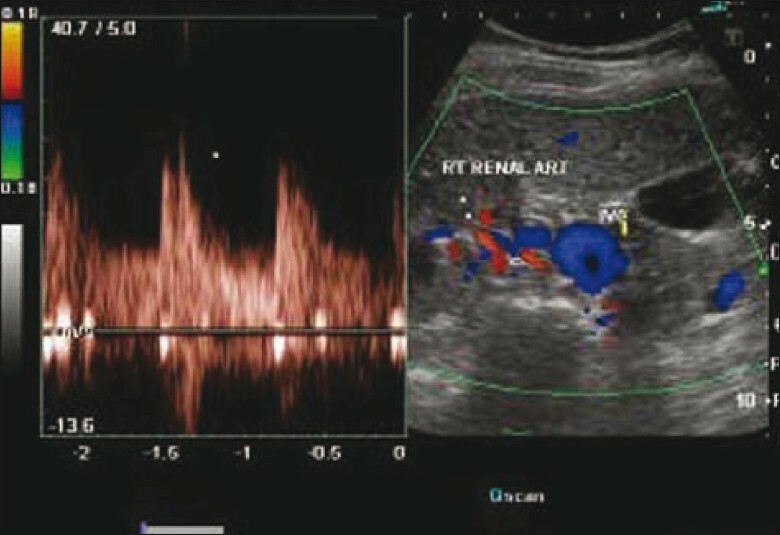 A few factors such as perioperative hypotension, use of potential nephrotoxic therapeutic agents, radio opaque contrast media in the recent past, intra-aortic balloon pump (IABP) and cardiopulmonary bypass have been blamed as the contributing factors to the causation of postoperative renal dysfunction in cardiac surgical patients. At times, in patients with renal failure and low cardiac output status, one may face the dilemma if the use of IABP is safe. We undertook this prospective observational study to determine the degree of possible renal injury when IABP is used by measuring serial values of serum creatinine and Cystatin C. Elective patients scheduled for off-pump coronary artery bypass surgery requiring preoperative use of IABP were included in this study. Cystatin C and serum creatinine levels were checked at fixed intervals after institution of IABP. Twenty-two patients were eligible for enrolment to the study. There was no significant change in the values of serum creatinine; from the basal value of 1.10 ± 0.233 to 0.98 ± 0.363 mg /dL (P value >0.05). Cystatin C levels significantly decreased from the basal level of 0.98 ± 0.29 to 0.89 ± 0.23 (P value <0.05). Contrary to the belief, Cystatin C, the early indicator of renal dysfunction decreases suggesting absence of renal injury after the use of IABP. Absence of elevation of cystatin C levels in our study suggests the lack of potential of the IABP to cause renal dysfunction in patients who received elective IABP therapy preoperatively. To evaluate the effect of thoracic epidural anesthesia (TEA) on tissue oxygen delivery and utilization in patients undergoing cardiac surgery. This prospective observational study was conducted in a tertiary referral heart hospital. A total of 25 patients undergoing elective off-pump coronary artery bypass surgery were enrolled in this study. All patients received thoracic epidural catheter in the most prominent inter-vertebral space between C7 and T3 on the day before operation. On the day of surgery, an arterial catheter and Swan Ganz catheter (capable of measuring cardiac index) was inserted. 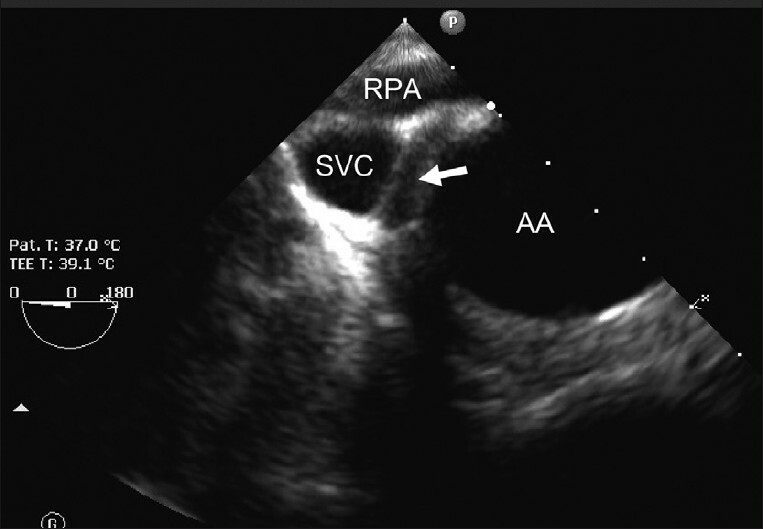 After administering full dose of local anesthetic in the epidural space, serial hemodynamic and oxygen transport parameters were measured for 30 minute prior to administration of general anesthesia, with which the study was culminated. A significant decrease in oxygen delivery index with insignificant changes in oxygen extraction and consumption indices was observed. We conclude that TEA does not affect tissue oxygenation despite a decrease in arterial pressures and cardiac output. Cardiac surgery with aid of cardiopulmonary bypass (CPB) is associated with neurological dysfunction. The presence of cerebrospecific protein S100β in serum is an indicator of cerebral damage. 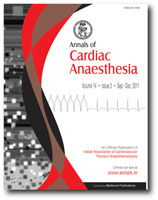 This study was designed to evaluate the influence of three different anesthesia techniques, on S100β levels, in patients undergoing coronary artery bypass grafting on CPB. A total of 180 patients were divided into three groups - each of who received sevoflurane, isoflurane and total intravenous anesthesia as part of the anesthetic technique, respectively. S100 were evaluated from venous sample at following time intervals - prior to induction of anesthesia (T1), after coming off CPB (T2); 12 h after aortic cross clamping (T3) and 24 h after aortic cross clamping (T4). In all three groups, maximal rise in S100β levels occurred after CPB which gradually declined over next 24 h, the levels at 24 h post-AOXC being significantly higher than baseline levels. Significantly low levels of S100β were noted at all postdose hours in the sevoflurane group, as compared to the total intravenous anesthesia (TIVA) group, and at 12 and 24 h postaortic cross clamp, in comparison to the isoflurane group. Comparing the isoflurane group with the TIVA group, the S100 levels were lower in the isoflurane group only at 24 h postaortic cross clamp. It was concluded that maximum rise in S100β levels occurs immediately after CPB with a gradual decline in next 24 h. The rise in S100β levels is significantly less in patients administered sevoflurane in comparison to isoflurane or TIVA. Hemodynamic parameters had no influence on the S100β levels during the first 24 h after surgery. 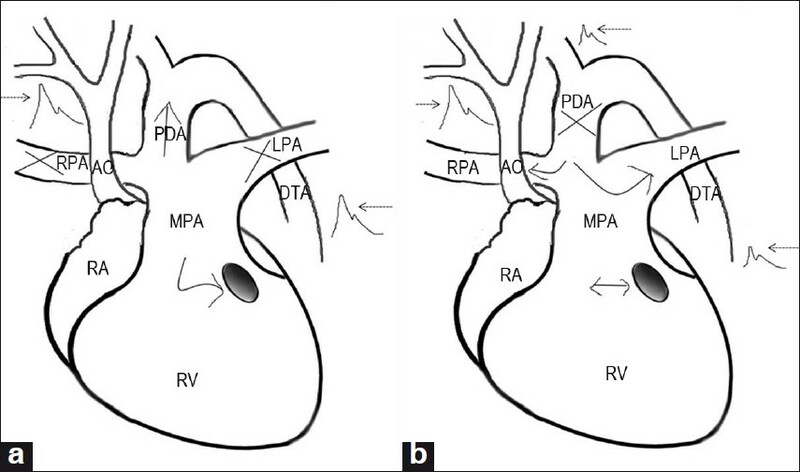 A patent ductus arteriosus (PDA) is often present in patients undergoing correction of congenital heart disease. It is well appreciated that during cardiopulmonary bypass (CPB), a PDA steals arterial inflow into pulmonary circulation, and may lead to systemic hypoperfusion, excessive pulmonary blood flow (PBF) and distention of the left heart. Therefore, PDA is preferably ligated before initiation of CPB. We describe acute decreases of arterial blood pressure and entropy score with the initiation of CPB and immediate increase in entropy score following the PDA ligation in a child undergoing intracardiac repair of ventricular septal defect and right ventricular infundibular stenosis. The observation strongly indicates that a PDA steals arterial inflow into pulmonary circulation and if the PDA is dissected and ligated on CPB or its ligation on CPB is delayed the cerebral perfusion is potentially compromised. Interruption of the aortic arch is a rare anomaly affecting 1% of children with congenital heart disease. The systemic circulation is ductal dependent and is determined principally by the ratio of the resistances in the systemic and the pulmonary vascular bed. Any increase in the pulmonary vascular resistance may increase the dead space ventilation due to acute pulmonary hypoperfusion. 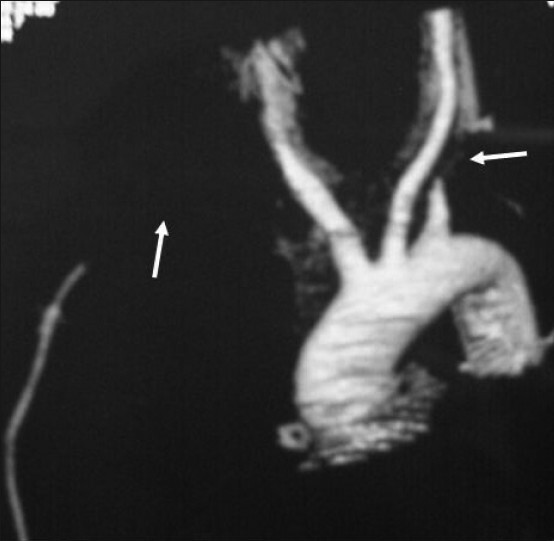 We report a case where sudden decreases in the end-tidal carbon-dioxide due to pulmonary hypoperfusion mimicked accidental endotracheal tube extubation in an infant undergoing repair of interrupted aortic arch. 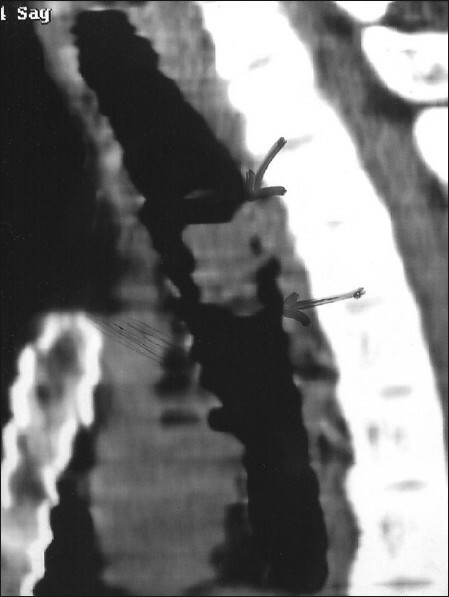 A 45-year-old female patient admitted for surgical management of carcinoma esophagus, presented with difficulty in insertion of left-sided 37 F and 35 F double lumen tube (Mallinckrodt® Broncho-Cath). 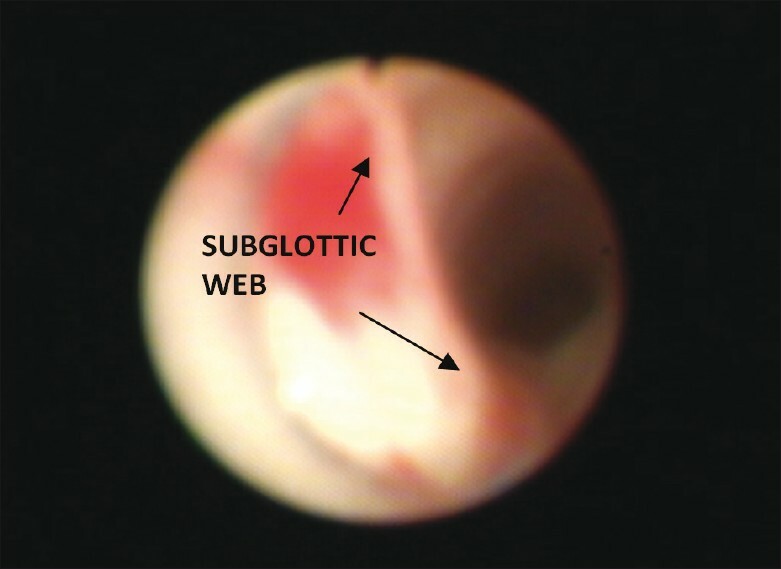 Fiberoptic bronchoscopy revealed a subglottic web in the larynx just below the vocal cords and a tracheal web just above the carina. Differential lung ventilation could be achieved with a 35 F internal diameter double lumen tube (Portex® Blueline® Endobronchial tube). Noonan syndrome (NS) is one of the most common non chromosomal syndrome presenting to the cardiac anesthesiologist for the management of various cardiac lesions, predominantly pulmonary stenosis (PS) (80%) and hypertrophic obstructive cardiomyopathy (HOCM) (30%). The presence of HOCM in NS makes these children susceptible to acute congestive heart failure due to hemodynamic fluctuations, thus necessitating optimization of drug and fluid therapy, careful conduct of anesthesia and providing adequate analgesia in the perioperative period. We describe a case of four year old boy with NS who presented to us for the management of PS and HOCM. 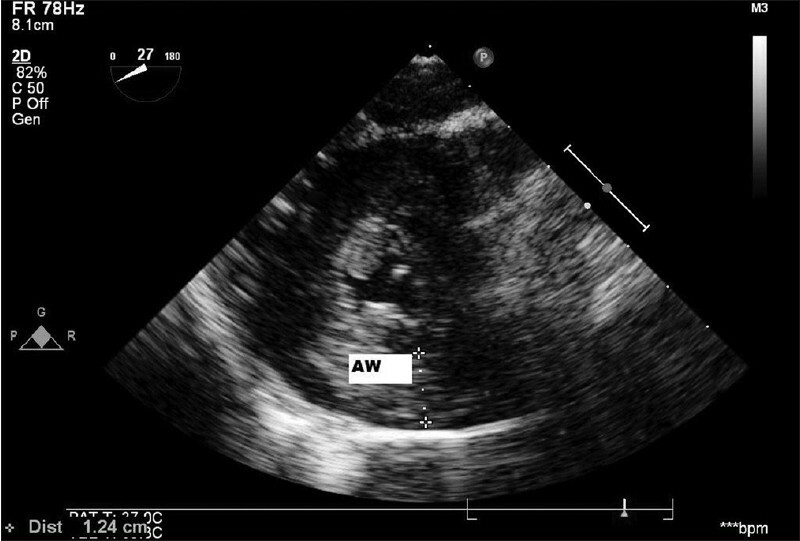 In our case, transesophageal echocardiography (TEE) played a major role in confirmation of the preoperative findings, detection of any new anomalies missed during the preoperative evaluation, intraoperative monitoring and assessment of the adequacy of repair in the immediate postoperative period. TEE provided invaluable help in taking critical surgical decisions, resulting in a favorable outcome. Extracorporeal membrane oxygenation (ECMO) is an adaptation of conventional cardiopulmonary bypass techniques to provide cardiopulmonary support. ECMO provides physiologic cardiopulmonary support to aid reversible aspects of the disease process and to allow recovery. ECMO does not provide treatment of the underlying disease. 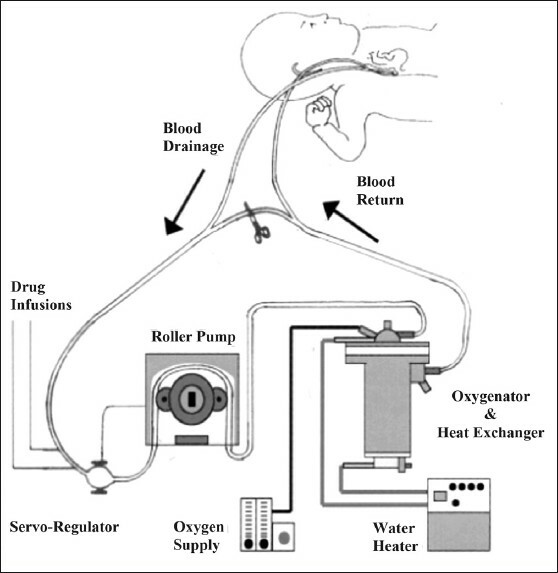 The indications for ECMO support have expanded from acute respiratory failure to acute cardiac failure refractory to conventional treatments from wide patient subsets involving neonates to adults. Vascular access for ECMO support is either percutaneous through a single-site, dual-lumen bicaval cannula or transthoracic via separate cannulas. The modes of support are either veno-venous or veno-arterial ECMO. In this article, the physiologic aspects of ECMO support are outlined.